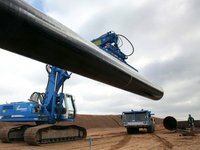 The European Parliament's resolution against Nord Stream 2 cannot stop the project, and such resolutions are getting fewer and fewer votes, Mario Mehren, the head of Germany's Wintershall said at a press conference. "This isn't the first resolution. It can't stop the project. It's interesting to me that the majority gets smaller and smaller with every vote," Mehren said. "Those who are interested in improving the climate need to stop torpedoing such projects. There's the sadly famous experience of South Stream [the predecessor of the TurkStream pipeline]. Was this good for anyone in Turkish or German industry?" he said.